Although it’s cold, windy, and rainy today, spring and summer are just around the corner. Here are a few Summer/Garden themed Bridal Shower invitations I made, perfect for all those Fall/Autumn weddings. 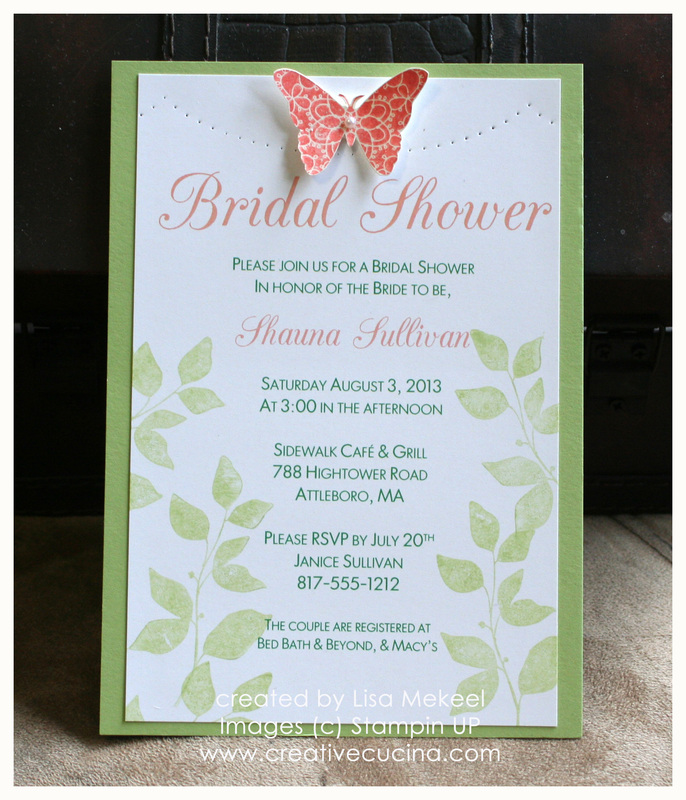 This invitation features a beautiful butterfly from the Creative Elements stamp set. It’s stamped in Calypso Coral ink and accented by Shimmer Mist. A small Basic Pearl in the center is the perfect accent. I also paper pierced the card stock using the Essential Paper Piercing Pack. Along the sides of the custom printed invitation, I stamped leaves from Summer Silhouettes in Certainly celery ink, stamped off once to give it a more subtle effect. The background card stock is also Certainly Celery. 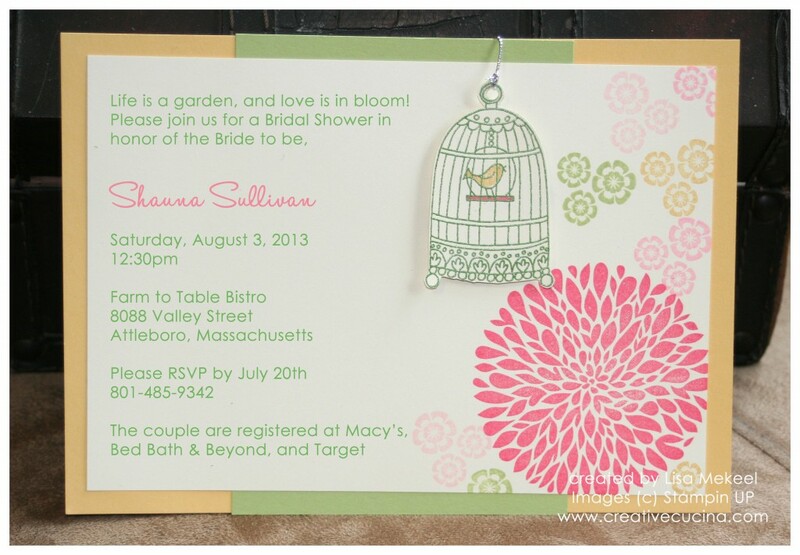 This bridal shower invitation features bright colors and an embossed birdcage “hanging” on the front. Most of the colors can be customized, but these shades of yellow, pink, and green seemed summery to me. 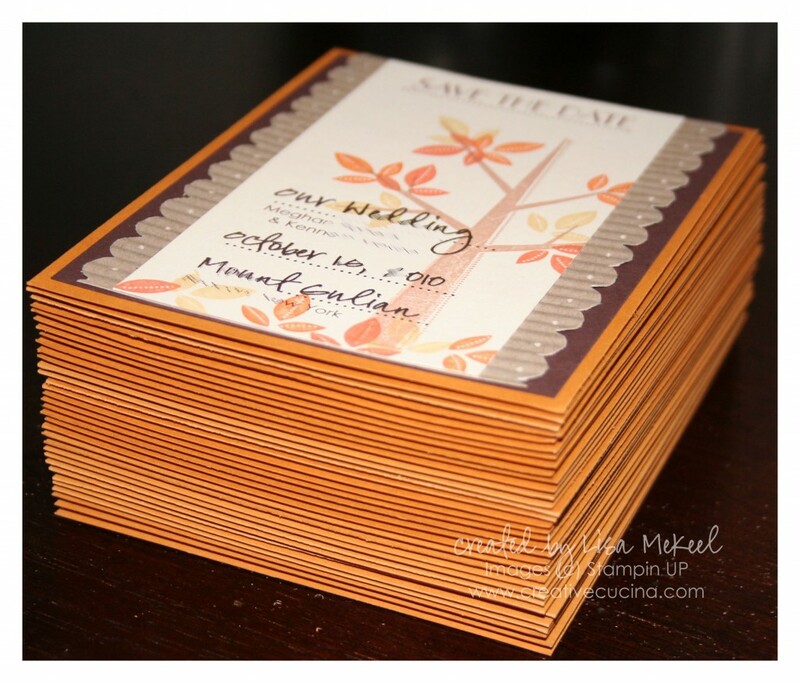 The base color is So Saffron, layered with a wide Certainly Celery strip of card stock. I stamped the flowers from Betsy’s Blossoms in various shades of pink, green, and yellow. The birdcage is from Chic Boutique and I embossed it with Wild Wasabi embossing powder. It’s attached to the card with a stampin dimensional and “hangs” with a bit of silver cord. 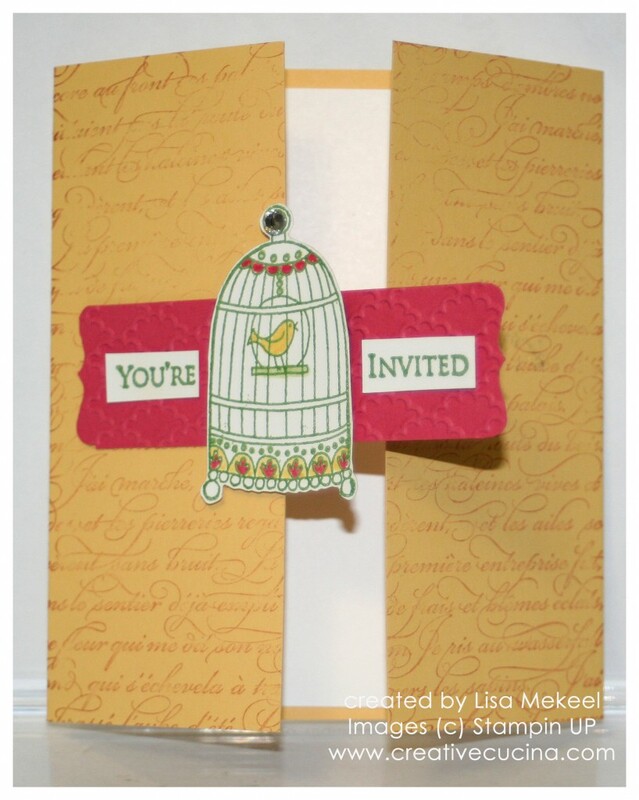 Here is another Bridal Shower invitation I made using the birdcage from Chic Boutique. The card is a gatefold style, with the front flaps opening up to reveal the invitation wording inside. The card measures standard A2 size (4 1/4″ x 5 1/2″) when closed. I stamped the front with En Francais in So Saffron ink, to match the card stock for a tone on tone effect. 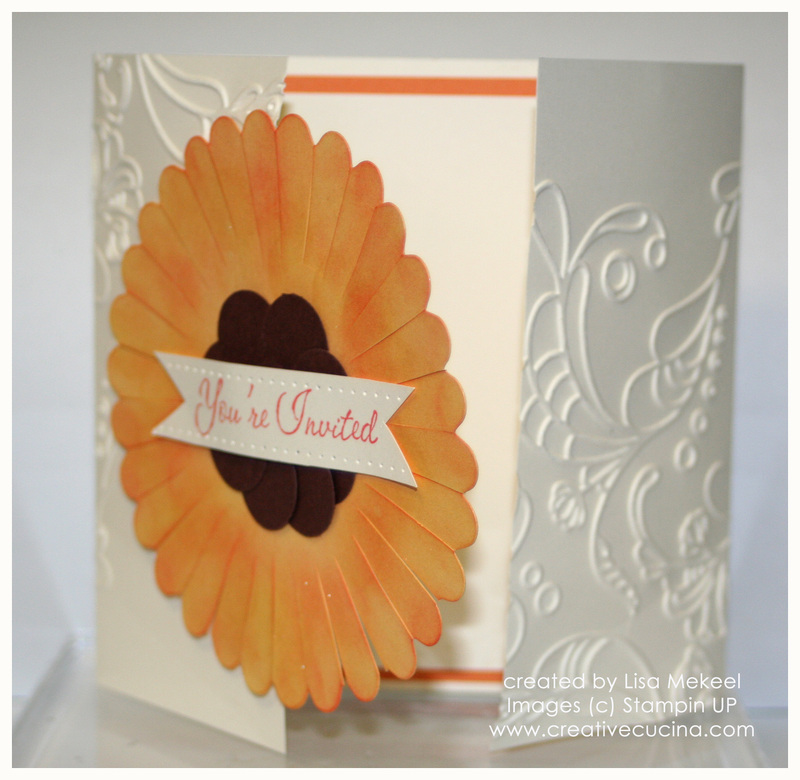 The strip across the front is Primrose Petals card stock, embossed with the Fancy Fan Embossing Folder. To get the points on each side, I slipped each end of the card stock into the Designer Label Punch and clipped off the ends. 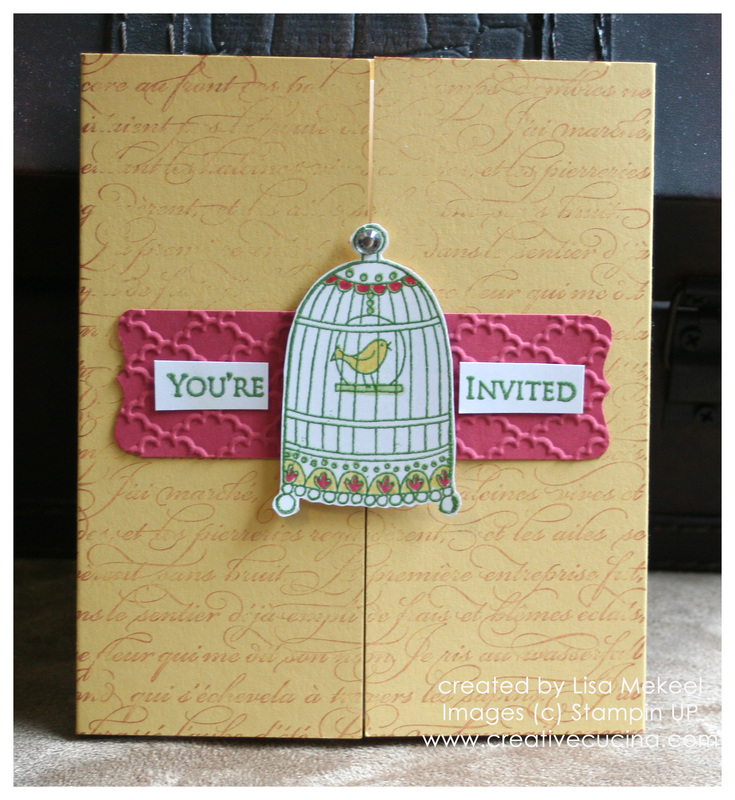 The birdcage is from Chic Boutique, embossed with Wild Wasabi ink and colored. It is attached to the card with a stampin dimensional. I also added a Basic Rhinestone Jewel at the top of the cage just because! 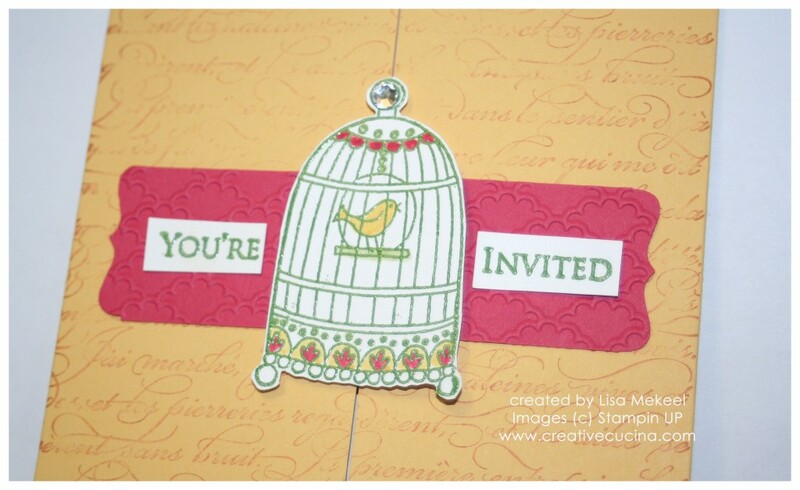 The words “You’re Invited” are from For the Bride stamp set, and also embossed with Wild Wasabi ink. 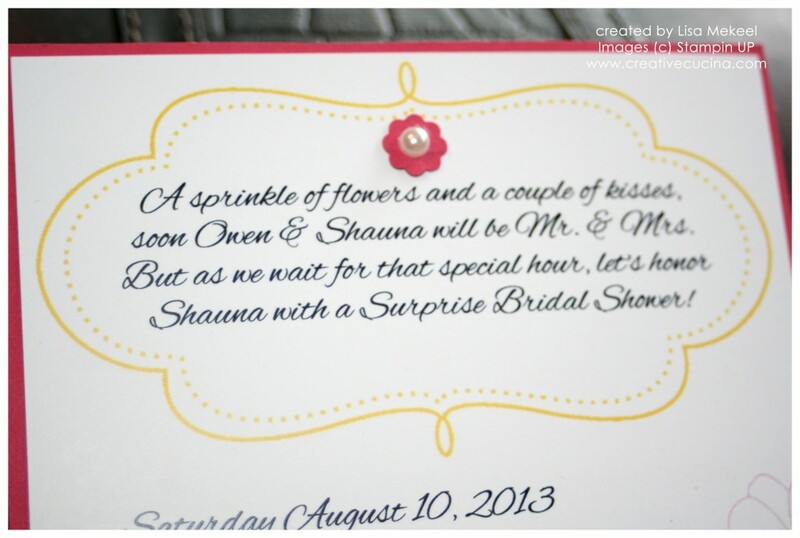 Inside, the card opens up to reveal the invitation wording, as shown above. 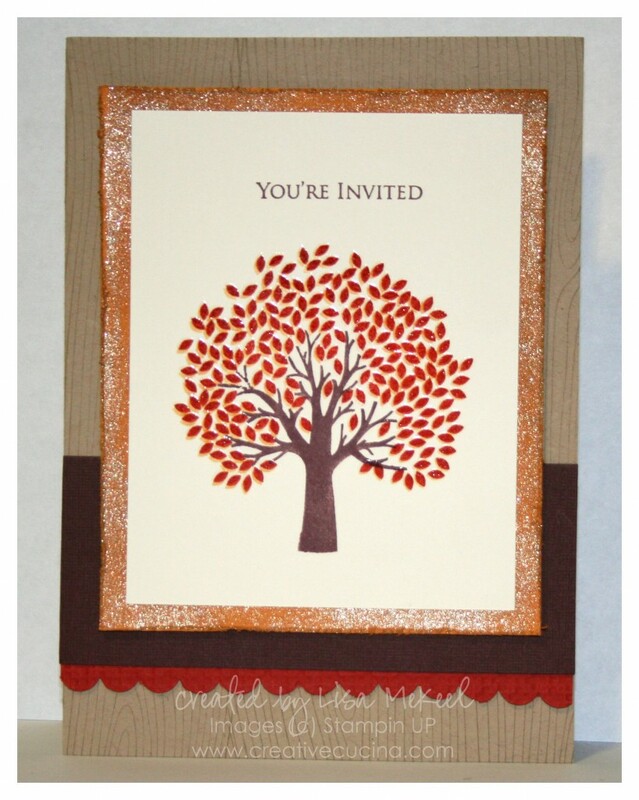 This is a simple but bold invitation, measuring 5″ x 7″. I created this using My Digital Studio, utilizing various brush stamp images from Simple Friendship. 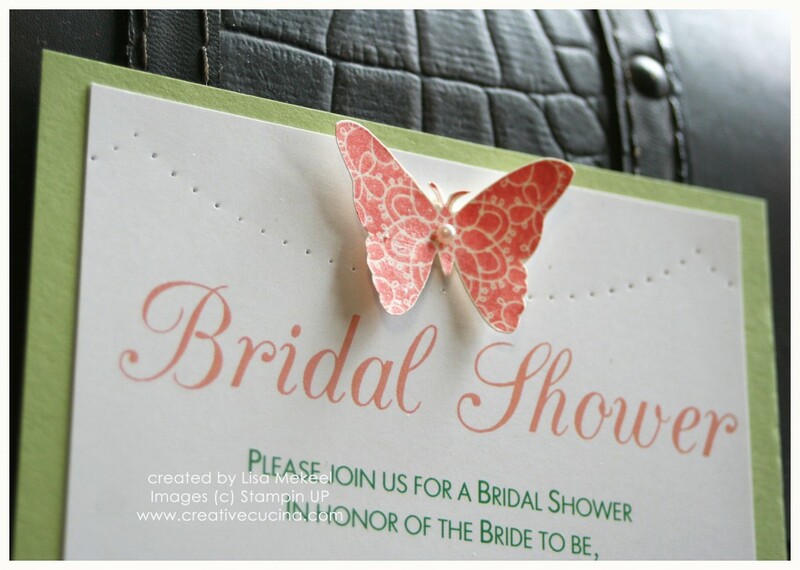 I found the poem at the top by searching for bridal shower invitation wording. 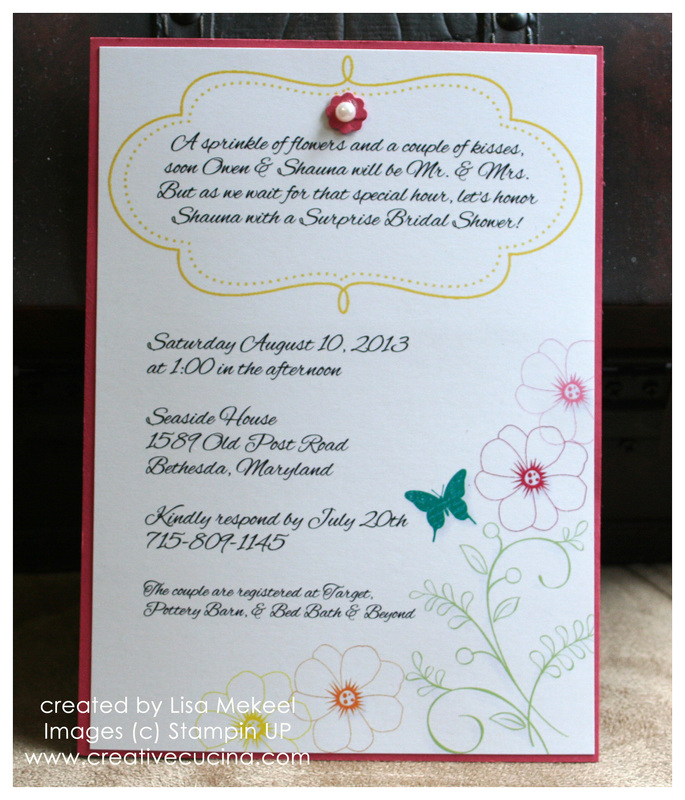 To give the invitation a little pop of color and dimension, I added a tiny paper flower and pearl at the top. This is a gorgeous card that could also be used as a wedding invitation. It measures 5 1/4″ square when closed. It’s an ivory Gatefold style card that features a large handmade sunflower and intricate embossing (Elegant Lines Embossing Folder). It is a little difficult to photograph, but the sunflower is sponged and spritzed with Shimmer Mist to give it some sparkle. To create the petals, I start with a large scallop circle and cut in between each scallop to create the “petals”. 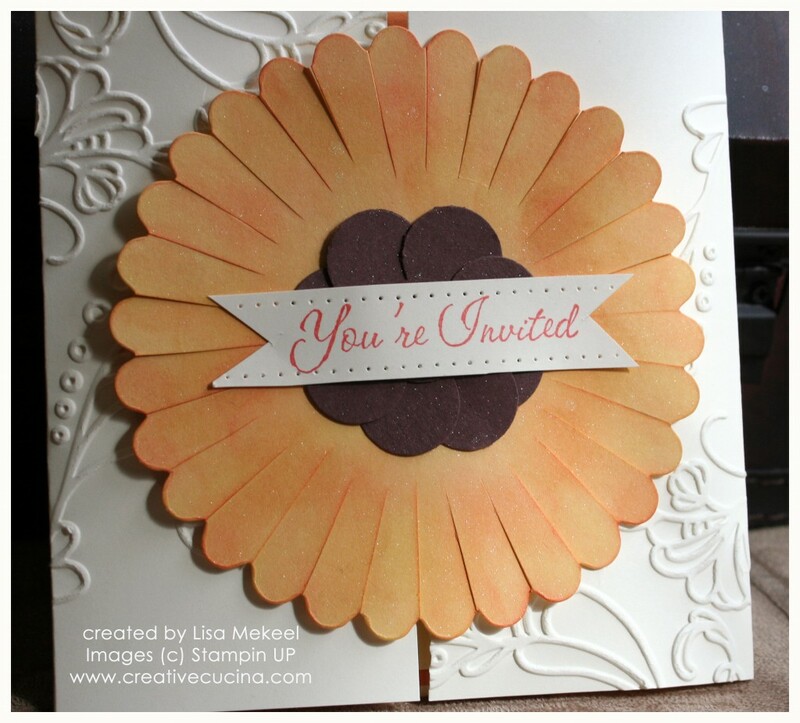 The center of the flower is made up of 1″ circles cut from Chocolate Chip card stock. In the center, I stamped “You’re Invited” in Calypso Coral ink on Very Vanilla card stock. Then, I paper pierced along the top and bottom and notched the edges with my paper snips to create a banner. The banner is slightly curved and attached to the sunflower with two tiny glue dots. Here is how the sunflower card opens. 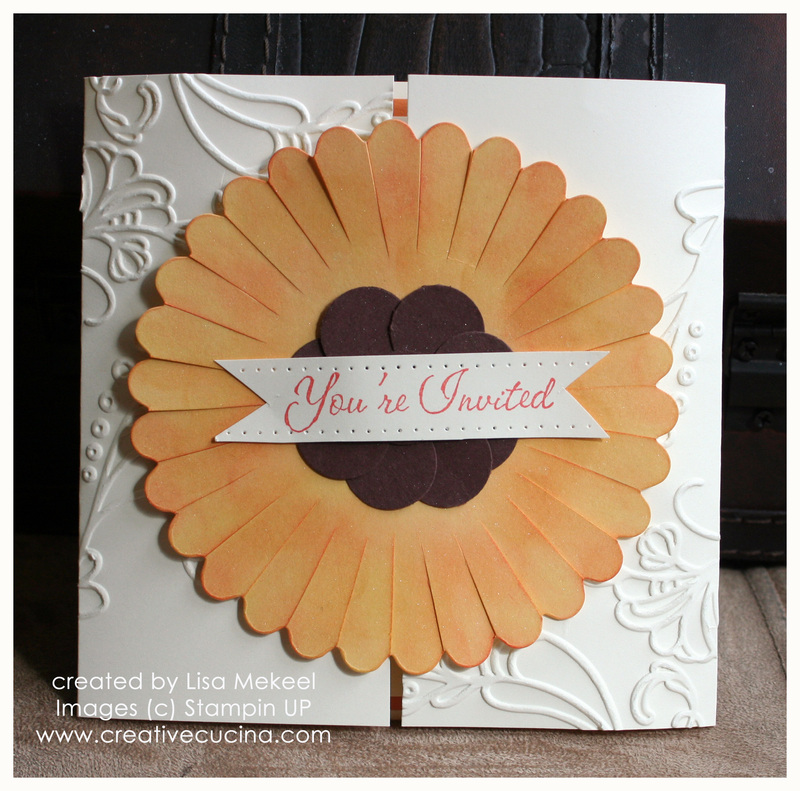 Inside, there is a coordinating color background, layered with the invitation wording panel. I’ve been pretty quiet the past week or so, because THIS is what I’ve been up to! Wedding cake, invitations, decorations, etc. 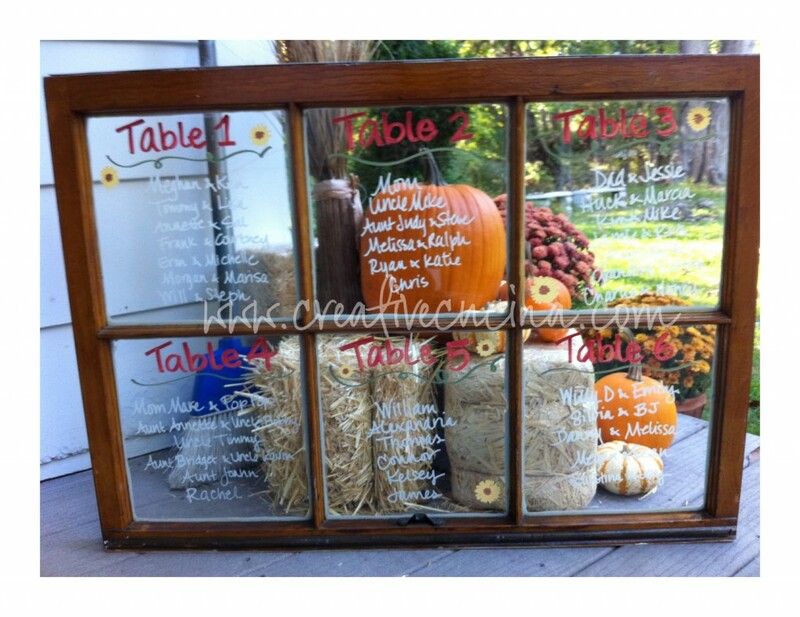 Not MY wedding–my brother in law and my new sister in law got married over the weekend in a beautiful, rustic, perfect fall wedding. I offered to help with invitations, cake, and anything else they needed. Here are the results! 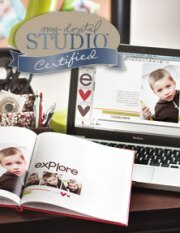 For more info on these Save the Date cards, click here. 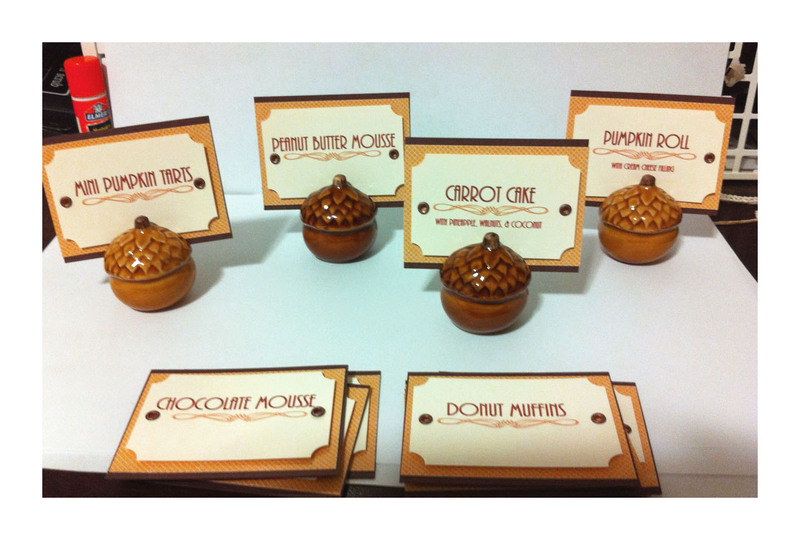 Accessories: Versamark, Clear Embossing Powder, Scallop Border Punch, Square Lattice Embossing Folder, Big Shot, Champagne Shimmer Paint, So Saffron Reinker, Cutter Kit (distressing), Cajun Craze Ink, So Saffron Ink, Chocolate Chip Ink, Crumb Cake Ink. 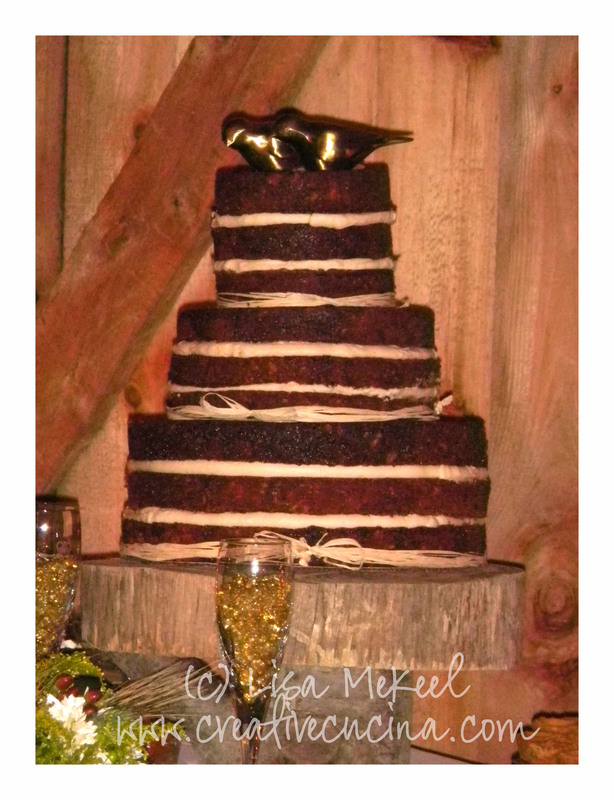 Wedding Cake is a rustic 3 tier (12″, 9″, 6″) Carrot Cake with Cream Cheese Frosting. I added some cinnamon and honey to the frosting, which gave it a nice flavor and slightly tan color, which matched the Raffia tied around the bottom of each tier. 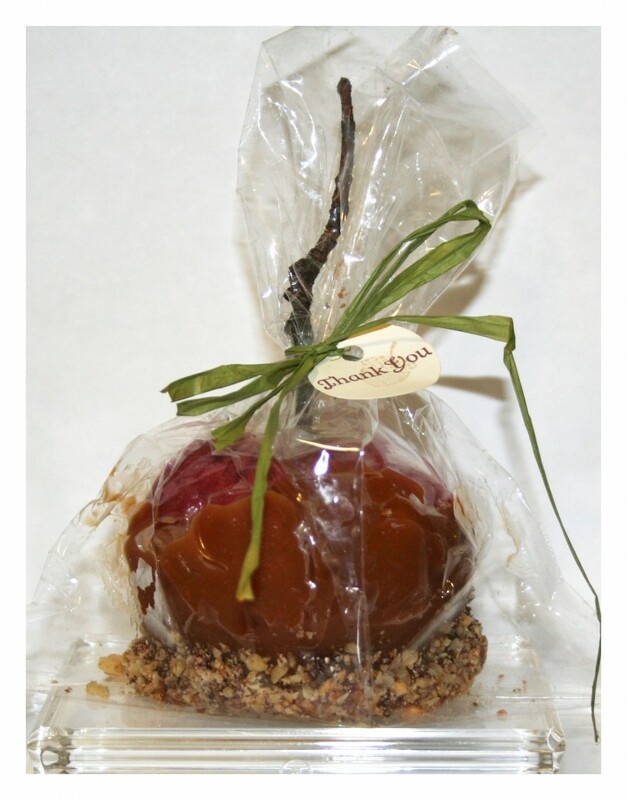 The apples were dipped in melted caramel (Kraft caramels worked the best! ), chopped walnuts & heath bar bits. We used twigs from my yard as a stick and tied the bags closed with various colors of raffia. I made the thank you tag with the Day of Gratitude stamp set, Very Vanilla card stock, and punched them out with a 1 1/8″ Circle Punch. I made this card for a friend’s wedding. The card is actually a 5 1/2″ square, just shy of 6″x6″ because the base is Shimmery White card stock, which only comes in 8 1/2″x11″. If I used another color, I would have cut a 12″x12″ piece in half and then scored it at 6″. The gold patterned acetate was from a craft store, adhered with glue dots to the base. I stamped the cake from For the Bride in chocolate chip craft ink and heat embossed it with clear embossing powder, also on shimmery white card stock. That was layered on a piece of gold card stock. Above the acetate, I added a strip of textured chocolate chip card stock running across the front of the card. Then, I adhered my cake image to the base with dimensionals. 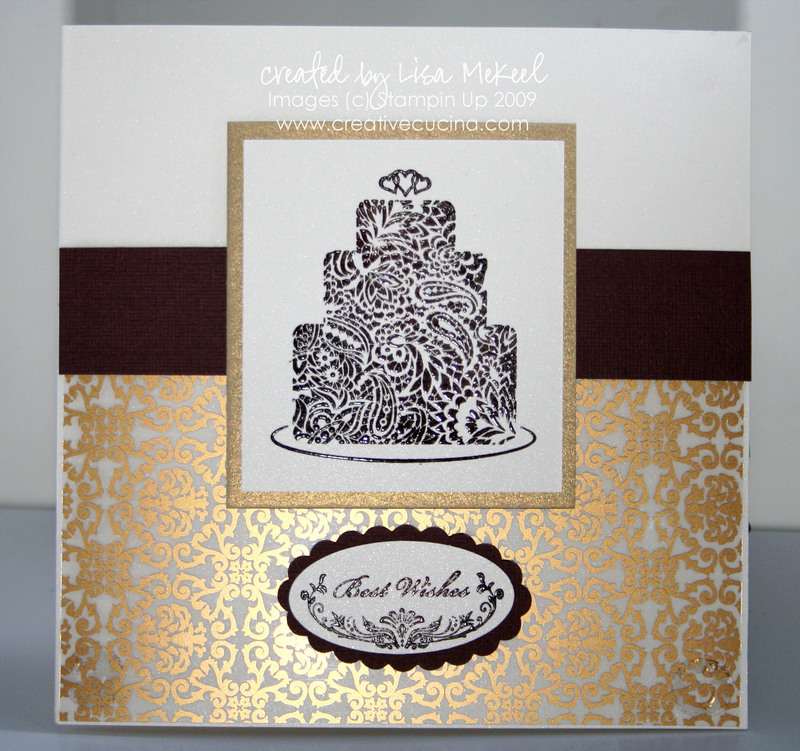 Underneath the cake, I stamped “best wishes” from Oval All in chocolate chip craft again, heat embossing with clear embossing powder and punched it out with the Large Oval Punch. That shimmery card stock oval was layered onto a textured chocolate chip Scallop Oval and adhered to the base with dimensionals. Inside, I stamped “Congratulations” from For the Bride in chocolate chip craft ink and heat embossed it with clear e.p. as well.